The TakeAway: An overview of this week’s events on climate change, corporate governance, and fiduciary duty. It’s a busy week for sustainable prosperity, as people journey to New York City, San Diego, and Cambridge to share insights and forge solutions to some of biggest problems affecting today’s world and economy: climate change, corporate and fiduciary governance, community revitalization, and social justice. We’ll be covering these events thematically, but today provide you with an overview so you can keep tabs on them, too. 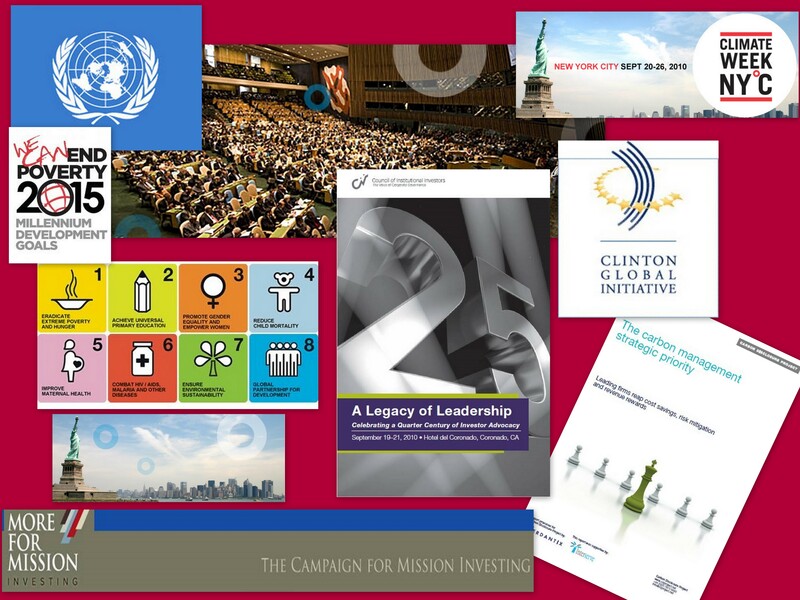 In New York, 140 world leaders converge on the United Nations for the 2010 MDG Summit on progress toward achieving the eight Millennium Development Goals (MDGs) – which range from halving extreme poverty to halting the spread of HIV/AIDS – by 2015. Last night, attendees considered how the digital revolution (especially broadband access and mobile phones) contributes to each MDG in developing countries, according to economist and Columbia University’s Earth Institute director Jeffrey Sachs. You can follow the discussion on Twitter at #MDGSummit. Meanwhile, on Tuesday, the Clinton Global Initiative (CGI) holds its annual meeting, to review action commitments within its core program areas of Education, Global Health, Environment and Energy, and Economic Empowerment. 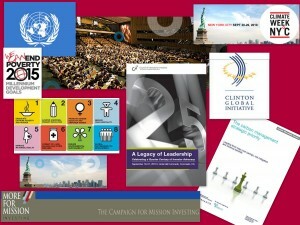 Twitter followers can follow @ClintonGlobal or @ClintonTweet to stay informed, as well as #cgi2010. The CGI meeting joins several other high-profile events constituting Climate Week NYºC, which begins today and runs through Sunday. Climate Week NYºC involves partnerships among The Climate Group (acting as secretariat), the United Nations, the UN Foundation, the City of New York, and the Carbon Disclosure Project (CDP). Dozens of clean tech and climate related events occur throughout Climate Week, beginning with the Carbon Disclosure Project’s Global Forum, at which four German companies – Siemens, Deutsche Post, BASF, Bayer – and Korea’s Samsung – were named the top five companies worldwide for carbon disclosure and performance. Founded in 2000, the Carbon Disclosure Project is an investor-backed initiative that promotes corporate monitoring and disclosure of greenhouse gas emissions and climate change strategies. You can keep up with Climate Week NYºC events on Twitter @ClimateWeekNYC as well as on Facebook. In San Diego, members of the Council of Institutional Investors (CII) gather this weekend through Wednesday to reflect upon “A Legacy of Leadership: Celebrating a Quarter Century of Investor Advocacy”. Founded in 1985, CII is a nonprofit association of public, union, and corporate pension funds with combined assets exceeding $3 trillion. Its mission: promote good corporate governance, shareowner rights, and related investment issues, while advocating for its membership. There’s a lot for CII to consider this year, given regulatory changes affecting fiduciary duty, proxy access, executive performance and compensation, and demands for better board – shareholder engagement—particularly within a social media context. Twitter followers can use #M4M2010 to keep track. In Cambridge, the More for Mission project of the Initiative for Responsible Investment at Harvard Kennedy School’s Hauser Center for Nonprofit Organizations holds its conference tonight and tomorrow on “Expanding the Field.” As of September 7th, More for Mission mobilized 78 foundations representing over $30 billion in total assets. What’s the goal of “mission investing”? Align both program and financial strategies across portfolio asset classes, while grounding them in a foundation’s core values and purpose. Mission investing is a modern version of program-related investments (PRIs), a concept pioneered by The Ford Foundation in the late 1960s aimed at community revitalization and social justice. This entry was posted in Climate Change, Corporate Governance, Public Policy, Stakeholder Engagement, Sustainable Investing. Bookmark the permalink.